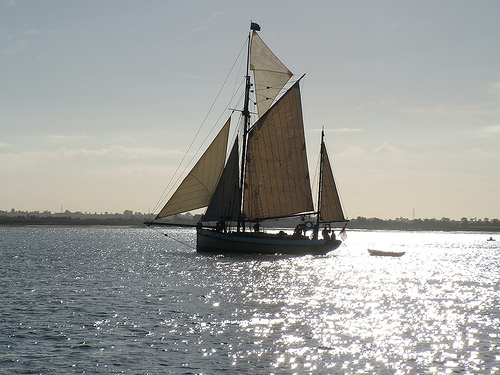 Referring of course to the classic boats sporting the popular gaff rig configuration of sails, the Yarmouth Old Gaffers Festival is an annual event that takes place on the Isle of Wight; providing a weekend filled with family entertainment. In 2014 the celebrations happen over Friday 30th May, through to Sunday 1st June. 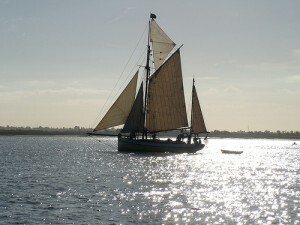 The Yarmouth Old Gaffers Festival attracts gaff rigged vessels from all over: with their distinctive square for and aft sails, suspended from the spar, called a gaff. They congregate in the picturesque harbour; an ideal spot for keen photographers; and you will also find a number of steam and motor boats bobbing amongst them. On the Saturday some venture out for races in the Solent, where you can see their sails straining on the horizon. There is plenty to see around the towns square and green, and not forgetting the Flower Festival in St James’ Church. To complement the historic boats there is a rally for classic and vintage cars; while the Lifeboat Station opens its doors to the public, highlighting the essential services they provide. On Friday afternoon the children’s fancy dress competition always draws a crowd, who can then take advantage of the fun fair; which includes a number of exciting travelling acts. Older visitors might well slope off to the delights of the ‘Oooh Arrh Gaffers Bar,’ the biggest real ale festival on the island, which stocks dozens of beers, sourced from far and near. A wide variety of food stalls are available to help mop up the distinctive ales. The picturesque town of Yarmouth, on the western side of the Isle of Wight, makes an ideal spot to visit at any time of year; easily reached from Southampton by Red Funnel ferries regular sailings, or Wightlink ferries from Lymington. The natural harbour is dominated by the castle, built by Henry VIII in 1547. A walk along the ‘Causeway,’ a disused railway track, is recommended, along the tree lined banks of the River Yar; if you are lucky you might catch a glimpse of a red squirrel. There are plenty of restaurants in the town and comfortable places to stay if you are making a weekend of it. As well as the shopping opportunities in town, the Yarmouth Old Gaffers Festival has its own artisan gift fayre and continental market stalls; somewhere to purchase a souvenir of your fun filled visit. The Old Gaffers Festival is an annual events which takes place at Yarmouth on the Isle of Wight. This year it will be running from Friday 31st May 2013 until Sunday 2nd June 2013 and it will also be celebrating 50 years. What are old gaffers? Well it can mean an old men or work foremen, but these old gaffers are traditional boats in which the sailing rig (configuration of sails) is four-cornered not triangular. This type of rig is held across the top by a pole called a gaff. A gaff rig is a very traditional rigging system and was replaced by the more popular Bermudan rig (with the triangular sail) in the early 1900. Thanks to the Old Gaffers Association we are lucky enough to be able to see a plethora or old gaffers at the festival in Yarmouth. The Old Gaffers Festival is a weekend dedicated to all things gaffer. Old Gaffers from all over the UK come to take part in races and to show off their beautiful lines. There are various races throughout the weekend not just for the old gaffers but other boats as well. As if viewing the spectacular classic and gaffed rigged boats in the harbour was not enough, there are also shoreside activities. 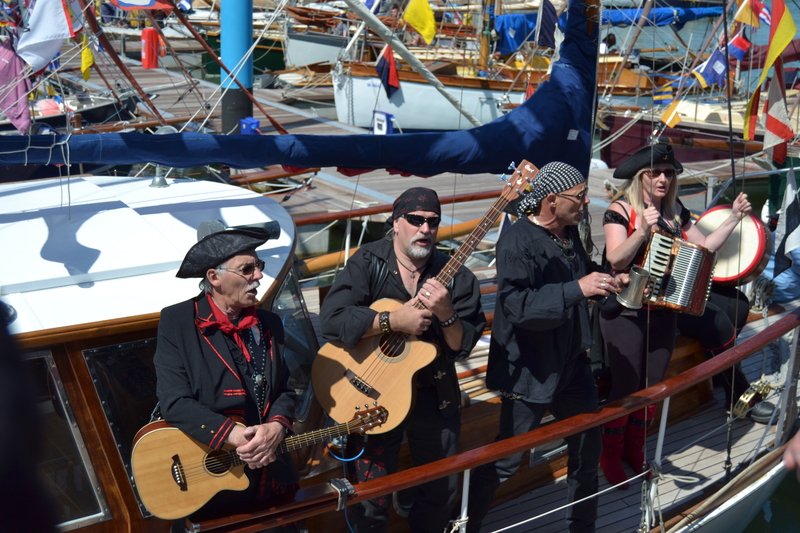 There will be street entertainment, a flower festival, live music, a craft fair and market, a continental market, lifeboat demonstrations, classic cars and much much more. For travel across to Yarmouth, there are several ferries to choose from. The Red Funnel ferry from Southampton which docks at Cowes or The Wight Link ferry from Portsmouth to Fishbourne. With these options you will need to take the car across to drive to Yarmouth on the West side of the Island. Alternatively you can catch the Wight Link Ferry from Lymington and this docks in Yarmouth. You could take the car on this route or travel as a foot passenger, leaving the car in Lymington. Gaffers are sailing boats with a gaff rig, a sailing rig (configuration of sails) in which the sail is four cornered. So called after the gaff, or spar pole that holds the sail up. 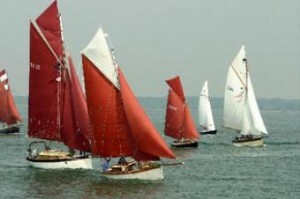 This annual festival see around 100 gaffers partaking in various races around Yarmouth’s picturesque harbour. There are shoreline activities for visitors including music, dancing, beer tent, refreshments, circus workshops, RNLI Lifeboat and Search and Rescue Helicoper and much much more. Lovesail will be attending the Festival so look out for us and feel free to ask us any questions about the site.